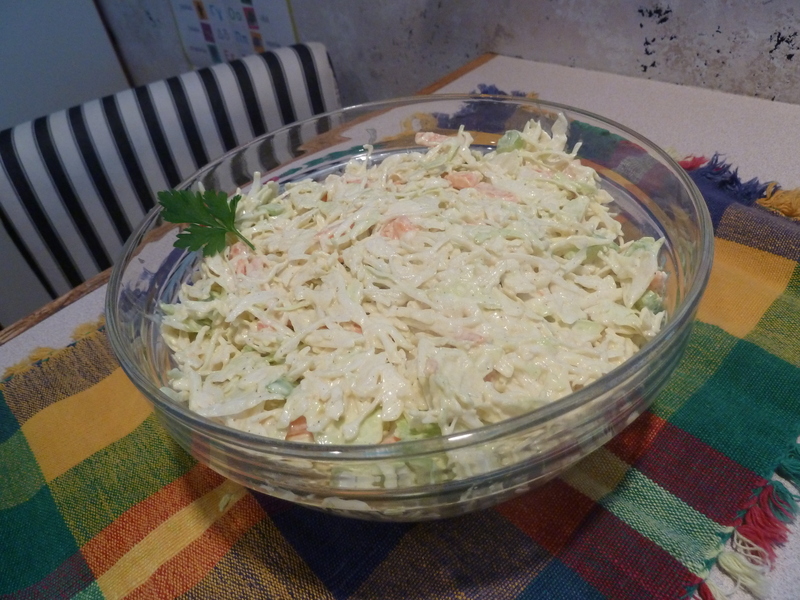 American Coleslaw is the name of this recipe in Mavoidi’s “183 Fresh Ideas” and it’s my husband’s favorite. At least my version of it. Why buy Coleslaw from the supermarket when you can make your own in five minutes and adjust the seasonings to your taste? How to make: To make the dressing, combine the mayonnaise with the mustard, vinegar, sugar, and pepper. In a big bowl toss the salad with the dressing. Ready! Notes and tips: Mavroidi uses 4 small onions instead of spring onions. She, also, adds a red pepper cubed and pine apple. The uncooked onion is too heavy for me and I don’t like the idea of adding pine-apple. I don’t mind the red-pepper at all but I usually do not have one in my refrigerator and I don’t think it adds significantly to make it part of the recipe.